Nick Pope and James Tarkowski’s England calls mean eight players to play under Sean Dyche at Burnley have been selected for a Three Lions squad. And former Claret Joey Barton sees no reason why Dyche couldn’t also make the step up to international football. 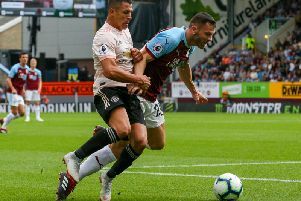 Danny Ings and Kieran Trippier were both capped by England after leaving Turf Moor, while Charlie Austin made a squad, without appearing for the senior side. Tom Heaton, Michael Keane and Jack Cork have gone on to made their Three Lions debuts, and Pope and Tarkowski hope to follow suit in Amsterdam against Holland on Friday, and at Wembley against Italy a week tonight. And Barton is certain that Clarets boss Dyche can go on to coach at the highest level. The 35-year-old declared that the former Watford chief carries the skillset to succeed at an elite club domestically, while holding the qualifications to govern the England national team. But Barton is hopeful that Dyche, who has been linked with vacancies at the likes of Sunderland, Crystal Palace, Leicester City and Everton in the past, will continue to hold down the fort at Turf Moor. “Well, Gareth Southgate is England manager,” said Barton. “I don’t think the England managerial post is a marker for whether you’re doing particularly well as a manager. “Can he go on to be England manager? “There’s absolutely no doubt about it. “He’s probably over-qualified to be England manager. “It all depends on whether he wants to or not, that would be the question. “Can he move up to the top six? I think he’s got to keep progressing Burnley. “He’s got the skillset to do it but does he want to? “Did anyone ever ask him if he wants to? People just keep linking him with jobs. “I haven’t ever heard him say that he wants to leave Burnley.